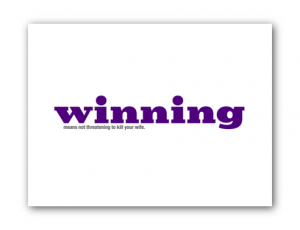 The pieces in the show pair Sheen’s newly-adopted catchphrase “winning” with examples drawn from Sheen’s past, putting the word in a more serious context than his own applications of it. It is a reminder that while Sheen may be entertaining, and it is possible to find entertainment in what appears to be his very public self-destruction, he has a history of violence that should not be overlooked. This series of six 18 × 24" digital prints, each available as an edition of 10, is printed on Canson Infinity Arches Velin Museum Rag (250gsm) using Epson UltraChrome HDR ink. Each print is available for $95, of which $75 will be donated to charities related to the issues of domestic violence and violence against women. Framing can also be arranged at a discounted rate through Raw Materials. Biography: Raised in Minnetonka, Minnesota, Jim Winstead Jr. graduated from Harvey Mudd College in Claremont, California, worked as a software engineer on children’s educational games, Internet web services, and database technology, and is one of the founders of Raw Materials. Jim lives and works in Los Angeles. For more information on the artist, please visit http://trainedmonkey.com/.